Best Selling Tippet used by many of the Worlds best Anglers. A high tenacity copolymer with excellent knot strength. PTFE coated for added abrasion resistance, stretch (26% elongation) and suppleness. Used for all species, the light gray colour provides superb camouflage in any sub aquatic environment. 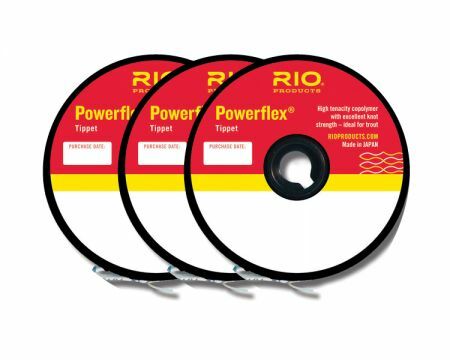 Dispensed from the interlocking, rotating, patented Tippetmaster spool with RIOs patented restraint design for easy withdrawal and replacement of tippet material. Specifications are printed on the elastic restraint and sizes are colour coded for easy identification. Powerflex is available as a standard 30 yard spool or in a useful, money-saving "triple pack" option. This consists of 3 standard 30 yard spools in a range of breaking strains/ diameters conveniently packaged in a handy plastic tub.